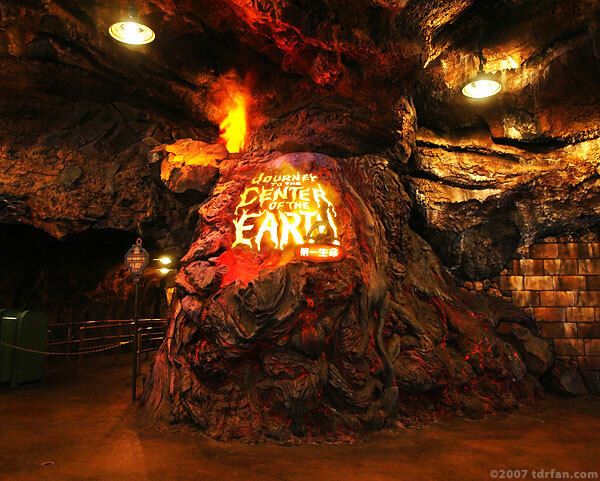 Journey to the Center of the Earth is one of the most thrilling attractions in Tokyo DisneySea. It is part dark ride, part thrill ride, and is unique to DisneySea. Based on the Jules Verne novel of the same name, Journey to the Center of the Earth takes you on a winding trip down to the earth's core. Along the way you will encounter crystal caverns, strange creatures, and a variety of special effects that make this attraction one incredible feast for the eyes. Often breathtaking, sometimes scary, you could ride this attraction dozens of times and still not see everything. The attraction's queue is nearly as exciting as the ride itself. The queue has two parts. The first part has you working your way past makeshift laboratories with items apparently taken from previous expeditions. This queue ends at one of several large elevators, which transport you at high speed down below the earth's surface. The second queue takes you past huge drilling machines, giant electrical transformers, and other support equipment necessary for a journey of this magnitude. The vehicles you ride in are pretty amazing themselves. They are large cars with giant shovels on the front, and look rugged enough to actually take you on a trip underground. The technology built into the cars allows them to travel smoothly at a variety of speeds, from slow, "sightseeing" tempo all the way to up rollercoaster quick. (I have read they are based on the same technology as the ride cars in Epcot's Test Track.) Although it gets pretty speedy at the end, the ride is never rough. Journey to the Center of the Earth is one of DisneySea's premier attractions, and unless you have no tolerance whatsoever for thrill rides, this is a "must do" attraction. This is a fantastic ride that does not disappoint.